Alright, we’re encroaching on some touchy ground here. I know. Please don’t publicly hang me with USB cable, nerds. I mean you no harm. As one of you, I am duty-bound to admit this is basically an open question that I am posing to myself and working through in a public space. So, put down the phasers and close your heat-vision eyelids, okay? I’m not going to dive into the canon of stories that have transpired. Instead, I want to wade in the theoretical futures of each character. There are too many alternate storylines to keep track of to be completely pious to every Superman and Batman narrative. It might also be my stressful memories coming back to haunt me, compelling me to paint this picture as starkly as I’m about to depict it. Being godlike has its drawbacks. Superman looks at the world through a different lens than we do. While Bruce Wayne is affluent and incredibly skilled, he knows he breathes air and fights the same limitations a child does. Superman is essentially an alien who was brought up as a human. One day, Clark realized that he had to wear the mantle of protecting our planet. His outsider vantage would make relating to a child’s needs really difficult and burping super dangerous. Batman, while he’s certainly dedicated, has more of a schedule than Superman, and though he may be fast and incredibly strong, Superman is called away often. He can hear the screams of the masses. He cannot simply shrug his duties to our world. Imagine you’re sitting with your son playing legos, and you hear someone being murdered. AWKWARD. Are you more of an a-hole if you speed away in your glorified underwear, or if you continued playing with your kid? That’s what I thought. Superman cannot divorce his work from his personal life. Kids would be another form of kryptonite. Batman suffered though he was raised with means. He’s working on his demons, his painful past and knows about “teachable moments.” These traits can be very important in teaching a child that not everything in the store is for sale. Kevlar is softer than steel in this case. Also, what if Superman’s kids were human? No powers. Think about about all the unreal expectations that a normal kid would have from dad who could fly and warm up Top Ramen with his eyes? What kind of a letdown would that be? Dads have enough intense expectations without superpowers. Or worse yet, what if he had flying rugrats who eventually went to school. Now, you know why Krypton exploded. Sure, Batman has some baggage, but I defy you to find a dad without. His experience would inform his parenting practices. He would know the loss of having an absent dad. He would cherish his time with his children. He would know the value of an engaged father and use every tool in his utility belt to provide a balanced life for them. Superman never met his parents and learned of them from crystals. Crystals. The guy basically learned about his parents from meth. Cool toys with badass armor and an awesome “angry dad voice” or brightly-colored underwear with the world on his shoulders. Which dad would you rather bring on a class field trip? Can you imagine how good Batman would be with Legos? I rest my case. Anyway, I know “Man of Steel” is about to premiere, and I swear I’m not hating on the dude. If anything, this new iteration should be closer to how the hero ought to be imagined: a real person in a real setting who wants to do right but struggles against the conflict between his ability to save those around him and his own self-preservation as a foreign body in the metaphorical immune system of Mankind. Whatever all that means. Which superhero would make a better dad? Losing a part, I gained a whole. I’m sorry, but there is no real argument here. Batman has been scientifically proven to have acute post-traumatic disorder ( http://ap.psychiatryonline.org/article.aspx?articleID=1209395&RelatedNewsArticles=true ). Child services would simply take the baby away. I don’t think having PTSD is reason enough to take a child away from their parents, though some counseling is definitely in order. I know this is an older post, but DAMIAN WAYNE. I rest my case. I have ptsd and a beautiful one year old girl. I get nervous but they never took her from me and I am raising her by myself. Strike that aurgument. Haha. Whoa, PTSD means child services takes away your kids? In what world does that happen? If child services took children away from all parents who have been traumatised by their own children (birth, sleepless nights, teething, accidents… TEENAGE YEARS! ), we’d all be childless! This was great! Thanks for the funny read! 1. Who better to help a kid who feels like they don’t “fit in” or are different than a guy who has been fighting that feeling for the past 75 years? 2. Superspeed. 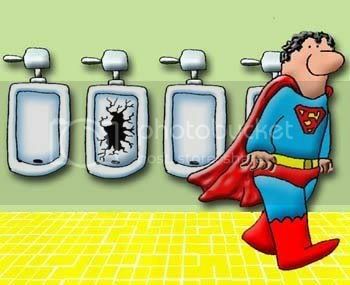 Who cares when or where he works, Superman will be back in a few seconds. Meanwhile, Batman works at night but him and the Batmobile are stuck in traffic and junior is going to be late getting to school. 3. Superman is a working stiff. Guy is a journalist. What can they bring in a year? $50 g’s tops. Batman is mega rich, has no real world worries. He’s a 1%er. He probably has an Occupy movement outside of Wayne Manor. Superman knows what it is like to work for what he has. 5. You can have your toys and armor, I’ll be flying around the world fast enough to turn back time. And lego’s? Hey buddy, how would you like Dad to use the buildings in lower Manhattan as lego’s? You would like that right buddy? Of course he would. Game set Kryptonian match. ^^ Yes to all of this. And fyi, Clarke did not learn parenting from meth. Jonathan and Martha Kent were good people. No, great people. And you damn well know it. Superboy wasn’t his son though. If he had a kid, you know he’d want to take full responsibility for it. Look at what he did when the idea of adopting Lor-Zod came up. Dude ripped apart a government convoy to keep him safe. Lor-Zod eventually became Nightwing thus bringing us full circle to Superman Dad > Batman Dad. Batman has commitment issues. Superman only loves one woman. Two. But I see your point. Clearly, you hate Ron Mattocks and all that is good in the world (but not in that order). Almost enough to have a baby to put in it! Muskrat is right: you hate me don’t you? And we were roomies for goodness’ sake! You, of course, have my attention, and there’s so much I could say to counter this argument that it merits a full blog post in response. It’s on. Damn you both for playing right into my wheelhouse. I’m teaming up with Ron and Clark Kent’s Lunchbox on this one. It will be my honor to be his sidekick. Bwahahaha! No vote. No challenge accepted. Just… Bwahahaha! Batman also has experience: in the comics, Batman is already a father, both natural and adoptive. Bwahaha – Jeff for the win. I was stuck between ‘can’t be’ and ‘aren’t’ — naturally, I used a bit of both. Forgot the most obvious one. Batman already wears a tool belt and has tons of cool toys. I bet he’d have an awesome stroller / diaper bag / wipe dispensers / etc. I have to disagree and I think jetts31 hits a lot of good points, and I’ll add mine. 1) Yes, Batman is human, and Superman is an alien but Batman’s child would be human and Superman’s child would be at least half alien, so they both could relate to their children in that way. Superman would have the added bonus of knowing what it was to grow up with parents that both were different than he was. Batman’s parenting skills would be established mostly by a single english butler (Why didn’t Batman develop an English accent?). 2) Yes Batman works at night, so he’s likely burning the candle at both ends and is poorly parenting, and poorly Batmanning (that’s a word now). Superman does not need sleep and therefore he can be available all the time. Superspeed basically makes him back before the kid knows he was gone (kind of like when my kid is looking out the window and I quick shove some food down my throat and return before he even realizes that daddy is starving). 3) But the fact that Bruce Wayne has an exorbitant amount of money means the kid will be raised knowing all the things in the store ARE for sale. Superman has dealt with his own demons, parents also dead, his entire species dead, being raised by adopted parents who have no powers. He would definitely be able to relate to a child who was different than his parents. 4) Batman would screw up his kid with all the secret identity stuff. Yes, Superman also has a secret identity, but his alter ego is a mild mannered reporter for a respected newspaper. Bruce Wayne is an egotistical narcissist womanizer. Bruce’s child would grow up being told, “think of others”, and then watch his dad on the news swimming in other people’s water fountains with models. Superman is an orphan who was raised by two loving people who didn’t have to tell him he wasn’t theirs until he was old enough to deal with it. Batman watched his parents get murdered and thought he was responsible. My husband has made this comment before, what would happen when Superman erm.. in the middle of making said baby, just releases and the force of his, erm, release, makes mummy go flying though the wall…? Can’t imagine Superman getting laid. Just sounds dangerous! My theory is artificial insemination and surrogate mother (Wonder Woman). Nah, I think Wonder Woman could take him…. Very likely Jason Todd and Damian Wayne would have something very different to say about your conclusions. Wolverine would be far more loving and reliable. Why has no one else stated the obvious: Captain America is obviously the best “super” father (and husband for that matter). Pmsl if he’s the same guy from the avengers I totally agree. But in all honesty I think Iron man takes the cake. Iron man would be the worst dad. THE WORST! But Iron man would be the best uncle. I guess he would be a fairly negligent dad. Let’s get this straight: ROBIN. ROBIN. ROBIN. ROBIN. He’s already taken care of four of them (and only one of them died!). He IS a dad already! Actually 2 have died. The newest one just died. but 2 out of 4 have survived, and that ain’t bad! Sure, if we’re talking about a litter of baby hamsters. What kind of baby carrier is batman using in the photo? It looks like a bjorn, but the child looks ergonomically supported…I’m confused. Someone needs to teach him crotch dangling babies are bad. Batman is a man of many inventions. Obviously an ergonomically designed, yet sleek and showy baby carrier is one of them. Lucious Fox is clearly a fan of safe babywearing. The only superhero would could be a good father is the one who gives up his superpowers for his children. I vote for Mister Incredible! I’m venturing into territory I know nothing about here, but can Superman even have kids? Is there a lady Superman he can have babies with? Because I’m pretty sure Supersperm can not be handled by a regular human womb. Also, clearly Batman would be the better dad because, as you said, Superman is a douche. Yeah, definitely Batman. Also because he’s his real self all day. Superman is someone else during the day, can you imagine how pissed his half super kids would be when they found out their Dad was lying about who he was his whole life? Also, their powers would only be half of what their Dad has- talk about always living in your father’s shadow. How brutal! Also, Superman is a total d-bag. And the people of Metropolis are Grade A idiots. If you can successfully be a public figure and still maintain anonymity with simply a pair of glasses, the people you’re surrounded by are probably not the brightest. 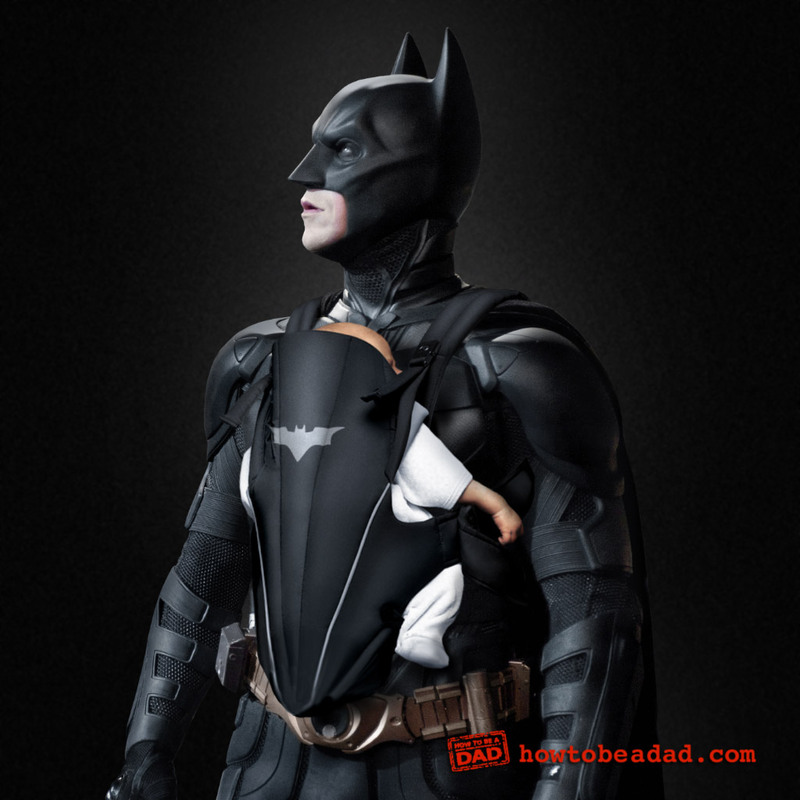 I just want to know where I can get a baby carrier/batman costume. Neither. The correct answer is Aquaman. He’d teach his kid to swim & tell all the man-eating creatures that live in water to leave his kid alone. Plus, on the 70s “SuperFriends” morning cartoon show, he always rode along in Wonder Woman’s invisible jet. So, he’s used to letting a hot woman drive. Perfect daddy material, I’d say. I would worry about Superman’s wife/baby’s momma. What would it be like receiving the seed of Superman? And then carrying his child? If the fetus kicked he could knock out a kidney or fracture her spine. I don’t think any human woman would be able to survive long enough to carry a Superfetus full term. So any kids he’d have would have to be adopted or created by some sort of test tube-ish fake womb apparatus. And that’s just freaky. Any human woman would die during the love making. It would have to be another Kryptonian or alien from another planet. The way you get Batman to win is by framing it to him as a contest. Because Batman. Always. Wins. If you don’t frame it as a competition to him, then all you get are child Robins. We actually get to see Batman’s parenting all the time. Seriously – WHERE DID YOU GET THE BABY CARRIER?! MUST HAVE for my husband. Seriously. Really. NEED it! You had to get it or make it or SOMETHING for the photo. Because the internet demanded it: my response. Of course Batman would be a better father, hasn’t he proved that with all of his orphan sons he has adopted? PTSD is not in itself a reason to take a child away. If you become violent or unstable, then yeah, I guess. But not every person suffering from PTSD is violent. C’mon. I agree with all this, though. Batman would make a rockin’ dad. 1. Now Pick A Better Mom 🙂 Jean Gray Or Rouge? Wonder Woman Or Storm? 2. PTSD is NOT a Reason To Remove A Child. PTSD does Not Equal Violent. But, Even If The Child Is Injured Because Of It Counseling Would Be Mandated. Mental Illness Does Not Equal Bad Parent. If Every PTSD Sufferer Lost Their Kids No War Vets Would Have Their Kids. 4. Didn’t Superman Discover His Powers As Opposed To Always Having Them? If So, Wouldn’t It Stand To Reason That A Fetus Would Not Have The Super Powers, There Would Not Be A Crazy Super Toddler Terrorizing The World.